Club Penguin Cheats by Mimo777 Club Penguin Cheats by Mimo777: Reviewed by You: Holidays! In the last Reviewed by You Club Penguin wanted to know, "What were your favorite parts of October, and what would you like to see in the future?" 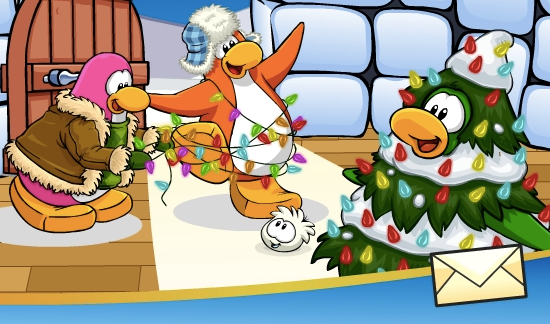 Well, my favourite part of October was the start of Club Penguins 8th anniversary party because it was the start of a special event in Club Penguins history and we could read the new yearbook and obtain the new party hat. Also a lot of Club Penguin moderators/bloggers came online to celebrate as well as Aunt Arctic! In the future, I would probably want some more Elite Penguin Force events such as Operation hot sauce because that event was more involved in Club Penguin. For this next Reviewed by You, Club Penguin wants to know...what is your favorite holiday and why? They'll pick one comment to feature in next week's Reviewed by You. If your review is featured next week, 10,000 coins will be added to your account! Don't forget to use your penguin name so the coins can be added!